· Heavy duty stainless steel welded frame built with 2 x 2 x 0.187 square tubes. · Adjustable positioning on most systems to minimize change parts requirements. · Minimum use of aluminum to increase machine life. · 48 in diameter prefeeder will accommodate a wide range of containers, from oz to gallons. One inner disc is included. · Air jet bottle reject system in prefeeder to minimize damage on wrongly positioned containers. · Hand wheel adjustable spacing belt to facilitate changeovers. · Calibration markings, labels and indicators to help document changeovers. · Bottle turning by pneumatic actuator to guarantee production speeds. · Prefeeder built at an angle to minimize bottle damage. · Single hand wheel adjustment for intake and delivery carrier belts, additional tweaking is also possible. · Delivery carrier belts have additional adjustments to guarantee container placement on conveyor. · Main belt system powered by ¾ Hp motor. · Power transmission through automotive rated timing belts. · Bottle handling from left to right. · Cad designed CNC manufactured, thoroughly tested before leaving our facility. · Silent low maintenance design. · Low electric and pneumatic consumption. · 30 cubic feet stainless steel hopper with 18 inch feed belt is standard. · Hopper service door standard. · Can work on existing or new conveyors. · Front protection by 3 polycarbonate sliding doors. · Leveling by mounting screws. Guarantee: 18 months on all parts under normal use, except belts. · Speed control on all motors installed on machine. · Easy access Start & Emergency stop. · Safety disconnect switch installed on electric panel. · Custom made electric panel incorporated into the design. · 15 CFM @ 80 p.s.i. SS316 stainless steel for bottle contact parts. Maximum speed is 200 bottles per minute. Stainless steel frame and transparent shield for operator safety and isolation from dust. Bottle orientating assembly is accurate, adjustable and user friendly. Bottles are discharged upright and properly arranged onto existing conveyor. 6" touch screen panel provide easy access to all settings. SelfSet™ function for automatic bottle setup. 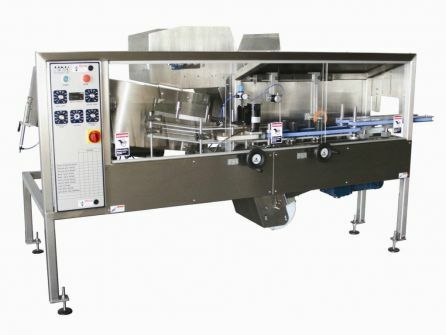 Automatic Speed Synchronization Setup: Operator simply places a bottle on the disc sorter, proper speed settings for bottle orientating and disc sorter are automatically determined according to the bottle size. Memory capacity for 10 job settings: Speeds of disc sorter, product separator and orientating belt, as well as bottle height, are saved for reuse. All speeds are automatically synchronized after SelfSet™ is accomplished. Locking casters as standard feature. Static eliminator in disc sorter. 220V, 50/60 Hz, single phase with separate ground. Bottle depalletizer machines remove one tier at a time from palletized bottles or cans, then remove the separation sheets to allow the next tier to be stripped off the top. Give us a call to learn more about the best system for your depalletizing needs. Rotary Unscrambling Tables sort round bottles to feed off the table in single file. Rotary feed tables are distinctive from rotary accumulating tables by the distinctive overhead tooling which helps accomplish the task of sorting. All rotary unscramblers have variable speed drives which comes in handy especially if fed bottles need to have separation. Dump Trays for bottles sent in reshipper cartons. Available in 24", 36", 42", 48" and 60"
Rotary Accumulators are used to accumulate finished product at the end of the packaging line. Accumulators will work with most any shaped product. 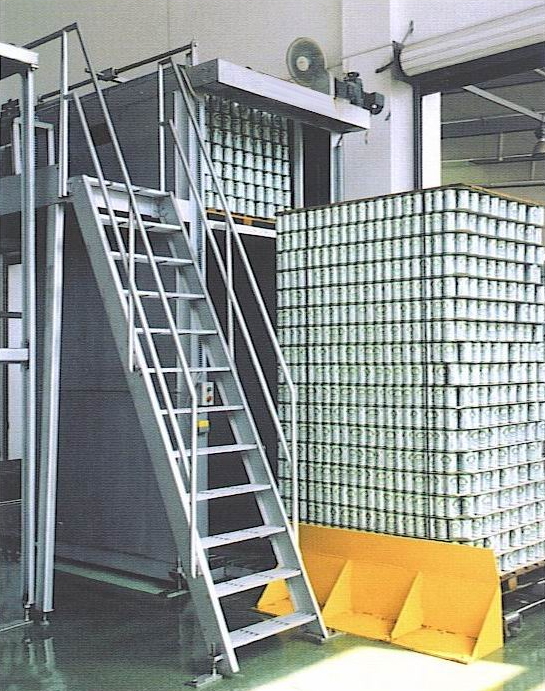 An accumulating table is used for packing cartons or trays and allows the operator to do other momentary tasks without interrupting the upstream production. All accumulators are available with variable speed drives and in 24" to 60" diameters.